Wayne Mansfield: Who Said Flopplies Were Useless? - this is pretty much the perfect HOW TO project: it begins with dumpster-diving, and was inspired by a desire to make a suit of plate-mail armor out of obsolete magnetic storage media. I hope this maker follows up with a HOW TO for the armor. 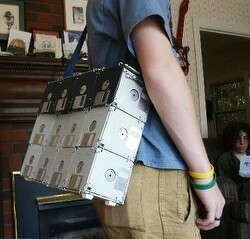 Now lets see you do that with a Flash Drive!